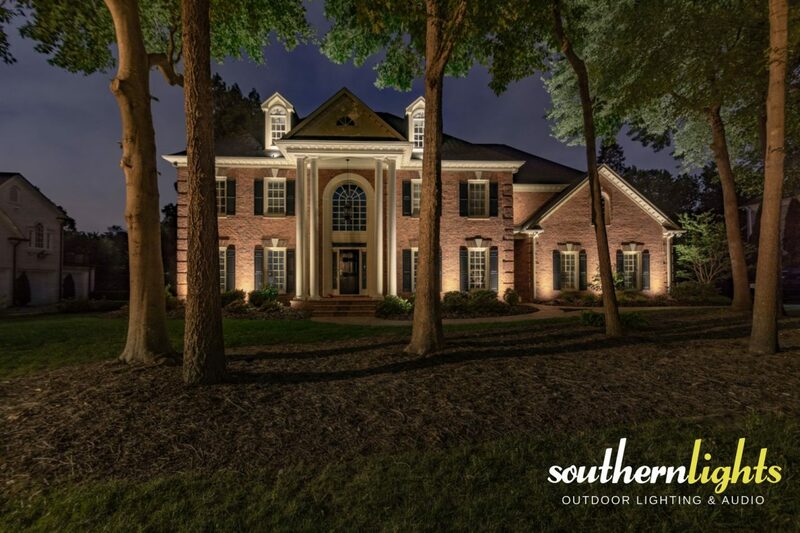 PROJECT SUMMARY: This amazing estate brick home illuminated in Greensboro, NC began with a lighting repair. Southern Lights not only installs new landscape lighting systems, but we also repair and service older outdoor lighting systems. This homeowner started their journey with Southern Lights Outdoor Lighting & Audio as they moved into this newly purchased estate brick home in Greensboro as a lighting repair customer. There was an existing system with fixtures strewn throughout the front yard, in trees, and around the foundation of the home when they arrived. Nothing was working and wires were visible everywhere. Our client contacted our Summerfield office for service where our owner and lighting designer, Pete Bryant met with the homeowners and looked at their existing outdoor lighting system. An honest assessment of their lighting system was given and the recommendation of a new low voltage lighting system was accepted. No longer will these homeowners have to worry about whether their outdoor lighting will be on to greet them as they come home from work. A bullet proof system and warranty was given to ensure this landscape lighting system will service them for decades to come. Even though this lighting design was simple, Southern Lights still spent time developing the layout and lighting design. During the design phase, Southern Lights provided the customer with additional lighting options that could be added onto down the road. The goal with any outdoor lighting design is to capture the essence of the subject, (in this case, the home), for our clients, creating the most ideal landscape lighting effect. LANDSCAPE LIGHTING FOCUS: Illuminating the eaves and soffits evenly on this home was our main focus. Consistency of light is important to Southern Lights, especially when installing outdoor landscape lighting on architecture. The Brick work and architecture of the home was the main focus, along with some safety lighting at their front steps. Safety lighting was needed to address the elevation changes at the front entrance. Security lighting was needed to help illuminate a very dark home and provide reflective lighting back onto the front yard. SERENITY lighting is always needed to give the space and property a clean and natural design during evening hours. LOCATION: The lighting designs and installation for this project can be found in the Provincetown Neighborhood of New Irving Park in Greensboro, NC, 27408. LANDSCAPE LIGHTING DESIGN: Ideal landscape lighting should evoke Safety. Security. SERENITY and should always start with a design. Southern Lights likes to start with “The End in Mind,” meaning that our lighting designs and installations are built for flexibility and additions as plant material grows or changes or additional outdoor landscape lighting is desired. Southern Lights has the opportunity to work with a lot of amazing clients and this couple was no different. Their love for their home shined through in their appreciation for the beautifully illuminated outdoor landscape lighting on this property. HURDLES TO OVERCOME: Designing an ideal landscape lighting system takes planning. Getting light to the right place takes some skill and time to coordinate installing wire to the desired fixture location. This home had a large beautiful front porch that limited Southern Lights from illuminating the home from the ground on the second story. So what did we do? Read on. This home had a flat roof above the front porch creating a further challenge for our lighting designer, Pete Bryant. In order for Southern Lights to spec out the right fixture a custom mount was needed to secure a fixture to. Years of experience in the outdoor landscape lighting world has taught us a thing or two about being creative. A perfect mount was created for a miniature directional low-voltage spot light and was installed carefully to keep all wire hidden and fixtures nearly invisible. Southern Lights didn’t have the opportunity to install the outdoor lighting before the plants were installed which meant some pruning was necessary on the existing landscape so that the light wouldn’t be obstructed by overgrown shrubs.